We talk a lot about building "digital services so good, people prefer to use them"; but we don't often talk about the people who are going to run those services. These people are very important. They're in charge of building, then maintaining, services that meet user needs and the criteria set out in the service standard. Government is going to be hiring a lot of service managers in the coming years, as the work of digital transformation continues. So what's it like being a service manager? What sort of things does a service manager think about all day? What's inside a service manager's head? Kit Collingwood-Richardson should know. She's the service manager for Lasting Power of Attorney, one of the 25 most-used services that are being digitised first as part of our transformation programme. We visited Kit at the Ministry of Justice to ask her all these questions and a few more. In this short interview (about 11 minutes), Kit explains "what irks and what works," what her team has learned from running a public beta, and what they're expecting to happen once the beta phase is complete and the service goes live. You can listen to the full interview in the embedded Soundcloud widget below. There's a full transcript further down. Alternatively, you can download a copy from the Internet Archive. Kit: My name’s Kit Collingwood-Richardson and I'm the Service Manager within the Office of the Public Guardian for the Lasting Power of Attorney exemplar service. Interviewer: Lovely. Can you briefly explain, as if to somebody who's never heard of it, what the service does? Kit: The service allows a user to apply for a Lasting Power of Attorney application online. It takes them through the application step-by-step, validates their answers, allows them to pay online and then to print it off for registration. Interviewer: Again, for somebody who doesn't know what a Lasting Power of Attorney is, what's that? Kit: A Lasting Power of Attorney is a deed that you put in place and it's something which protects you if you were to lack mental capacity in the future. You appoint people through a Lasting Power of Attorney, so that those appointed people can manage your affairs if you were to ever lack mental capacity in the future. Interviewer: Can you briefly describe how the digital service that you've got running now improves on the service that it replaces? Kit: Sure. At the moment we take in about 300,000 LPA applications per year. Up until now it's been an entirely paper-based service, and the pack of forms and guidance that you need to get you through that service is about an inch thick; it's about the thickness of a 10p coin. It makes it really, really hard for people, actually, to wade through all of those words and to be able to make a decision about the people they want to manage their affairs, a really, really important set of decisions. What our tool does is obviously does away with the paper at the point that you're filling in the form, and it takes you through simple questions step-by-step to really clarify what you're trying to do. It means that you can stay clearheaded and make those decisions quickly, simply, without having too much paperwork in your way. Interviewer: What's the status of the service at the moment? Kit: It's in public beta at the moment and has been since last year, and we're just getting ready to go live actually, just preparing now. Interviewer: When is that likely to happen? Kit: We've committed to doing it for June; we might do it a little bit ahead of time. We’re just at the point of finalising the functionality that we need, we’re testing the service to make sure it's robust enough to go live, and we're arranging our service standard assessments, which is a really important part of going live with any exemplar service. Interviewer: With regard to the set of 25 exemplars that is part of the GDS transformation programme, you're at a fairly advanced stage; you're blazing a trail as far as reaching the end of your public beta goes. Interviewer: The question that might arise in some people's heads is: what did you get out of doing your public beta? What have you learned from it? Kit: It's almost: what haven't we learned? At the point we went to public beta, we actually didn't do a private beta, which some services have done; we went straight from alpha to public beta. The journey that we've been on since then has taken us from really the basic form-filling service, with some validation, to a point where I feel confident that we can go live and offer the best possible user experience we can. That's enabled us to obviously track our users, track their journeys, find out what really works for them. We've obviously really matured the functionality through being a live service, and I can't really overstate how important that's been for us, that live learning. It means that we've been able to understand what really irks people, what really works for people, and we've made a lot of changes based on that. Also, we've been able to find out how satisfied people are with our service through using it live, which is a great feeling. At the technical level, we know that can make our service scalable now, which you couldn't do theoretically if you hadn't gone into public beta with it. We've learned a hell of a lot; it's been a real journey. Interviewer: One of the things that GDS is working on is support for service managers who are already managing a service, but equally as important, service managers who are about to begin managing a service in the weeks, and months, and years ahead. Interviewer: If you imagine, you've probably seen the those cartoons where it's a cartoon head drawn from the side, and you can see inside the person's brain, and you can see all the things that occupy their brain, their thoughts all the time. What's inside a service manager's head? Kit: On any given day, what will generally be inside my head regarding LPA is – and these are in no priority order – I will have a user occupying most of my head, because we hate to lose sight of them. On any given day, I will be looking at our analytics, which we find really, really important, seeing what people are looking for in that tool and seeing whether people are happy, seeing things like completion rates. It'll be focusing on what they're doing. I've got a big stakeholder bubble. We know that certain people are really excited about us going live; we know that we've got some challenges about going live. At the moment I'm thinking a lot about who we have to tell, whose expectations we have to manage, who’s really happy, who I need to make happy, so there’s a big stakeholder bubble. There's a little finance bubble in there as well, where I think, “How much am I spending? Am I giving value for money to our fee payers, actually?” OPG is fee-funded, so I've got a big finance bubble in my head. 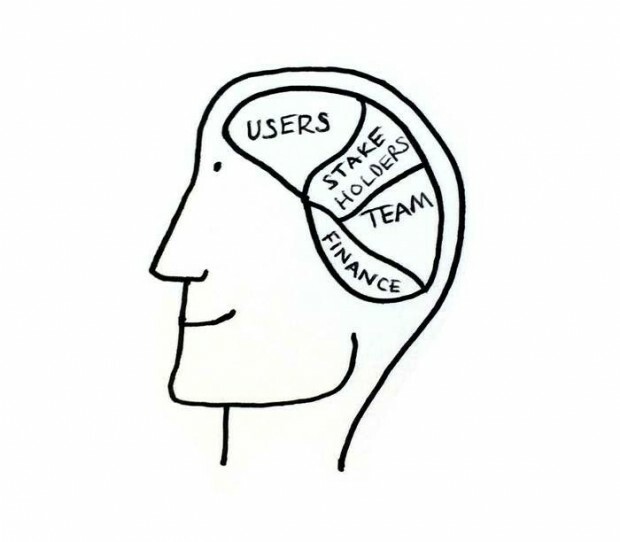 Then the other biggest bubble is the team one, so I've definitely got a big focus on what I see as a key part of a service manager's role, which is supporting a product owner, supporting a delivery manager, and supporting developers. I spend a lot of my time unblocking their problems actually, and that's the bit that I think is a massive focus of my job. Interviewer: If you had a chance to talk to some of those other service managers – perhaps you already have, I don't know – what would be the two or three most important, most useful tips that you would have for them as they embark on managing a service? Kit: Yes, I do actually; I've given a few talks as part of the service manager induction training, which I should probably say is absolutely amazing training. I'm not talking about my bit of it, but it's incredibly comprehensive and very useful. I will leave aside the bit of advice that says, “Go on the service manager training,” but if I were going to talk to myself a year ago, which is when I started this role, I would say, “Don't underestimate relationship management,” would be the single biggest one. I think I probably underestimated at the beginning of this journey – and I took over just before we went into beta – that keeping people happy, keeping people comfortable, telling people what you're doing, being open, being transparent, and having great relationships with people is actually the way to the best possible user experience, because the lines between users, developers, senior managers, stakeholders, if any one of those is cut, you are going to end up with really, really poor outcomes. Relationship management is one of them; support, oddly enough, is another one which is really, really looming large in my mind at the moment. It is focusing on making your service sustainable, and the way to make your service sustainable in the terms that we use, in agile terms, is making sure that you can support this service after going live or after you go into beta, and how you enable continuous deployment. I think there’s generally an acceptance that we want products to stay alive now, and that kind of language is getting very much into people's heads, but actually the realisation of that and “What does a support model look like for a bit of software in Government that needs to be continuously iterated?” is actually a bigger problem than I think people are grasping at the moment, some people at least. That is compounded where you're working with legacy services, and legacy systems, and legacy teams. That's one of the biggest things, is where you've got to make a service sustainable, really, really focusing on that from the outset. Then probably the third one is the service manual, which is... I find myself saying this a lot, but actually I believe that the service manual is one of the best bits of guidance I've ever read in my job. I don't just mean my job as a service manager; I mean my job, period, in the civil service. It's incredibly well written, and it's clear, and it's concise, and every single person I bring into my team has to read it. If you keep that with you, you probably shouldn't stray too far. Interviewer: You're very close to launching a live service, properly live, going from public beta; what are your thoughts on how different it’s going to be once it’s live? Is it going to be different or will it be pretty much the same as it's been during public beta? How will it be different if it's going to be different? Kit: Yes, that's a really good question actually. I think, from the user's point of view, day minus one to day one of going live won’t be a great deal different actually. The user interface is going to be the same; we're not deploying some massive new feature. We never deploy massive new features; we release regularly as small and frequent a releasing as possible. The user, I'm hoping, will have the same great experience with us that they've always had. What it means for us as a product team is massive actually, underneath all that, for two reasons; firstly, there is the pride that a team gets from having launched a service live and having passed a service standards assessment, fingers crossed. Secondly, actually, it's about robustness, because it happens to be with LPA. We've been pretty happy with the user experience, the front, for some time actually. We know that people are very happy with it, but we've been working a lot on scalability at the platform level. We've committed that we won't go live until we can realise that scalability, so for us the process of going live means that we can start to really push LPA Digital in a way that we haven't been able to and we've been quite frustrated with so far. Because we've committed not to go live until we're really confident about scalability, it means to us the start of a really, really nice journey of awareness-raising and being able to really, really get into the meat of channel shift, which means a lot to us. Kit: Very; very, very excited. Yes, as I say, there's a pride element to it. There's a bit of a nice nervousness in going first. We’ve always... It happens to be with timing and with a bit of a fair wind. OPG has been one of the first to do quite a few things and we're one of the first to be doing this as well. Yes, we're incredibly excited about going live.